You know, based on the cover art and the synopses of this book and last week’s, I would never have expected them to have so much in common. I think I am justified in thinking that. And yet here I am. I’ve read two very similarly-themed books in as many weeks while, and this is the important part, actively trying to avoid doing so. I guess once in a long while you can’t judge a book by its cover. What we have this week, then, is another interesting science fiction setup that takes a backseat to the human element. 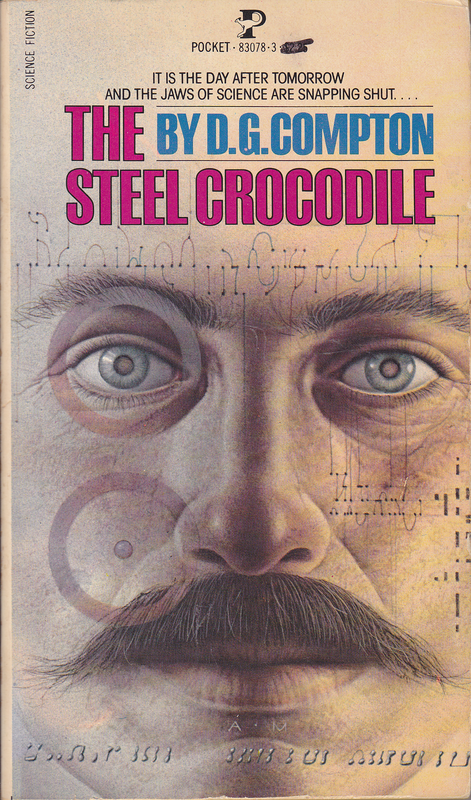 The Steel Crocodile is more than anything a story about a married couple who love each other very much but enter into some circumstances that change them in ways that cause them to begin to doubt their feelings for one another. It’s very competently told, as well. As a novel about interpersonal relationships and the nature of stress and things like that, this book is absolutely a winner. So why did it have to be science fiction? Matthew and Abigail Oliver are the married couple. Matthew has just accepted a position at THE COLINDALE, a sort of pan-European think-tank with mysterious motivations. He’s some kind of sociologist. Part of Matthew’s reasoning for accepting this position, apart from the great honor it is to have it offered, is that he is friends with a guy named Gryphon. Gryphon is a member of the C.L.C., some kind of futuristic European version of the ACLU. Legally the C.L.C. doesn’t actually exist, because in this novel we have some kind of a weird dystopia setup that I’ll try to describe for you. See, this book takes place at some point in the future. It never makes it explicitly clear when it takes place, but hints are dropped every now and then. The most clear one is a reference to a paper that Matthew’s predecessor at The Colindale wrote in 1987. Also Abigail has a still-living grandfather who apparently served in the Great War. I’m guessing this book takes place at some point in the early nineties, then, but I can’t be all that sure. This future is somewhere between Brave New World and Nineteen Eighty-Four but with a few twists all its own. Everyone in this setting is being constantly monitored by the government, but it is also for reasons I’m not entirely sure about considered every person’s duty to make this monitoring as difficult as possible. There’s a lot I didn’t understand about this book, to be honest. What made it so weird, and in some ways interesting, is that the narrator of this book is what I’d call Third Person Extremely Limited. We get very, very little exposition in this book that doesn’t come out of a character’s mouth. When they do mention some aspect of the culture they don’t explain it. We’re just meant to figure it out via context or dismiss it as unimportant, I guess. Here’s the infuriating thing: This whole book is some kind of extreme case of avoiding some of the most common writing pitfalls. For one, this book never tells, it always shows. But what it shows is scarce and unexplained knowledge. The other thing it avoids is the really contrived “As You Know” sort of dialogue. From a book that had little of what I’d call humor in it, I couldn’t help but wonder what was up with that. The science fiction part of this book is pretty much there only to instigate the human drama that develops. And that’s fine. Science fiction is (in my opinion) often at its best when it’s exploring the human element rather than the technical. That’s just the way I swing. But again, this book goes to such an extreme at it that if I believed in stuff I’d say that stuff was happening. A very tiny part of me honestly believes that this author figured out exactly the things that I like in a book and then took them to ridiculous lengths. If someone wanted to convince me that the things I like in science fiction were stupid they could present this book to me as a fantastic strawman argument. Or reducto ad absurdum. Slippery slope? Back to the plot, though. Matthew isn’t super keen on using his new position to spy. He’s just not that sort of person. His wife, Abigail, is also not particularly that sort of person. They’re just two regular people in a crazy world. Thing is, it’s hard to summarize all the ups and downs that their relationship goes through because it’s all over the place. It’s really very human. Also right after we meet this Gryphon guy we find out he’s been killed mysteriously. The real mystery of the book is what The Colindale is up to. Everybody wants to know. It’s super-secret. Matthew has to wait to be inducted into the group before they’ll even tell him. Also while he’s working and living there he’s being constantly monitored, even more so than when he was in regular old London. That whole “everyone’s duty is to avoid being watched” mentality does not fly in The Colindale. Everybody acts really weird all the time. Matthew’s predecessor was murdered, as well. No one wants to fill Matthew in on the details. So this kind of thing is what leads to early stresses on Matthew and Abigail’s relationship. But there’s something else about this book I haven’t told you about, something that is also interesting but also a bit mystifying. See, the book doesn’t always focus on Matthew. It’s about fifty-fifty, really. Sometimes Matthew is the viewpoint character and sometimes it’s Abigail. They each have their own little stories, vignettes really, that intertwine in really complex ways that neither of them know about. Sometimes we’ll get the same scene played out from each of their points of view. What the author does really brilliantly is separating their knowledge from one another. Matthew is being stressed out by his job, Abigail is being stressed out by some issues with her family, and when the other is around they just put on a stiff upper lip and say what a wonderful day it’s been. I don’t think I’ve ever seen characters written this convincingly. I’m being totally serious about that. It makes the book really hard to follow. Eventually we get to find out just what the science fiction element of this book is, and boy is it a doozy. You may remember Bohn, the computer mentioned on the back of the book. It’s really not as sinister as the liar who wrote that synopsis wanted it to be. Bohn is just a tool, a computer, and the people running him are actually trying to do their best for humanity in a way that has only one real downside: it restricts freedom. See, what Bohn does is be creative. Sort of. What happens is that every scientific paper from every discipline from all across the world is loaded into this machine and it starts going through them. The guy in charge of this whole thing defines creativity as, simply put, the ability to take two or more ideas and see the link between them that no one else has. So this computer is the ultimate in creativity, if that’s how you define it. It’s constantly looking at the corpus of science, looking for ways that any two or more discoveries can link up to form some kind of new paradigm or invention or further discovery. The scientists will look at this fact and then extrapolate the effects this will have on humanity, for better or worse. Basically this machine is powered by James Burke’s Connections. If you’re not familiar with that BBC show, the idea is that James Burke would pick some historical development like the horse collar and then follow the chain of developments that led to the Space Shuttle. It’s a fascinating show and you can occasionally catch full episodes on Youtube. In the context of this book, one of the things that happens is that somebody discovers a new way of looking at electromagnetism, for example. The machine pairs this up with a bunch of other papers and decides that it will eventually lead to a method of creating an electromagnetic shield that will block nuclear missiles. Whatever global power discovers this first will likely use it to prevent retaliation from its own nuclear strike against another power. This is bad, so the scientists have to figure out what to do. You might expect it to be some kind of clinical application of logic that would be dehumanizing, but that is in fact not the case. Things like morality and ethics also come into play, so it’s not all that bad. Except that sometimes the only solution is to prevent some scientist from publishing a discovery so that something else won’t come about. And that’s bad, I guess. The really bad thing that’s going on is that the super-secret part of this already secret project is using texts about history, theology, psychology, sociology, and so forth to create a new world religion. Yeah! It’s pretty cool. Basically the social scientists are looking at what made “real” religions so successful, things like when they came about and what psychological needs they serve, so that they can create a new one for modern times. Of course, the first thing one might think is that some megalomaniac is using this to make himself a messiah or something, but it’s not even like that. The whole thing is an attempt to help people find meaning in the modern world and thus some approximation of happiness. What goes wrong is that Bohn keeps making references in its output code to what looks like a scientific paper that no one can find. SM 101, it keeps saying. The scientists are looking furiously for this paper so they can figure out what it means. Skipping ahead, and this is great, it turns out that this reference is not to a scientific paper but rather to the instruction manual for the computer itself. Namely, the circuit diagram. Bohn was using this as a means of saying that it is the messiah they’re looking for. People need to worship a computer. All that, though, is waaaaay in the background to the human drama. Abigail is having a crisis of faith, for one thing. Her brother has just showed up and it looks like his plan is to destroy the computer and reveal its terrible plot to the world. Of course, he doesn’t know a damn thing about what’s going on. He’s just a dumb kid who thinks he’s fighting tyranny. In a way he’s right? Matthew is having his own crisis although its more of an identity crisis. He’s discovering things about himself that he’d rather not know, things that would likely mean an end to his marriage if he started to act on them. Since the entire plot of the book was basically revealing to the audience what was going on with this computer, I guess I can safely skip to the end. Abigail’s brother uses one of the guys working for The Colindale to put a bomb in the computer room. His goal isn’t to kill anybody, though, so they manage to get everybody out of that building before the bomb goes up. Problem is, this guy has a real problem with the director of this project and so decides to try and keep him in the building so he dies. Matthew is there finishing up some work when he discovers this so he tries to put a stop to it. He doesn’t know there’s a bomb, though. He’s just trying to stop what appears to be a murder. In a pretty unsatisfying ending, the bomb explodes, destroying Bohn and killing Matthew and the director of the project. Abigail can see the explosion from a distance, has a breakdown, and the book ends. Okay, so what just happened here? Why did this book actually need to be science fiction, for one thing? It really could have happened in almost any setting. It’s the story of two people under stress. The stress changes them and they grow more distant. What was once an idyllic marriage grows into something less than that. It’s a tragic story and a well-done one. So why is there a supercomputer that tries to proclaim itself the messiah for the modern world? Why this whole setup? Could it just be that D.G. Compton was told to write a science fiction novel and so threw that element, albeit a really interesting element, into a regular old book he was thinking about doing anyway? I’m really torn on this one, folks. I really want to like it but there’s so much that mystifies and confounds me. The society it set up was both interesting and impenetrable. The sci-fi element was fascinating and I really wanted to see more of it, but somehow I feel like if it were more the focus of the book it would have lost something or gotten really preachy. It’s left up to the reader to decide whether what these guys were doing is morally correct or some variety of tyrannical. They had a genuine interest in serving and protecting humanity and they were using some really good (in-universe) techniques of doing that. Basically, I guess, the real question we have to face is how we’d feel about some kind of scienceocracy. And once again, it’s like it took one of my beliefs and took it to a crazy extreme. Yeah, I think it would be great if our government leaders understood science a little better. I think a lot of intelligent people do. But this book supposes an end result of scientist tyrants making decisions about the future on our behalf. And that’s bad. Isn’t it? As a book that makes me question my beliefs and how I view the world, it was a success. And as a book that provides a look at people under stress, their feelings and motivations and reactions, it was also a success. What I have a problem with is that the two successes didn’t jive together to create an even greater success. They conflicted. What I’ve ended up with was a book that I like for two different reasons, but in the meantime I don’t like that those two different reasons are in my head at the same time. D.G. Compton, Wikipedia tells me that you’re still alive. I want to have a beer with you and talk about this book for a long time. Compton has long been one of my favorite authors — this is an intensely humanist SF novel with some complex female characters…. This is not one of his best though (very solid in my book). One of my top 5 novels of all time is The Unsleeping Eye (original title: The Continuous Katherine Mortenhoe) (1974). HIGHLY recommended. Just picked up by Gollancz for their masterwork list. I’ll be on the lookout for it and anything else by him. While I found this book sometimes infuriating and occasionally really confusing, it was always in a way that I could somehow appreciate. I think reading more of Compton’s work would give me some insight into just what his deal is. The Unsleeping Eyes is brutal — near future (all his settings almost are new futures) where people do not die young. Woman in her 40s has a rare terminal illness, a reality television channel wants to make a documentary of her last days. She refuses, they implant a camera in a disgruntled man’s eyes and he’s set up as her friend…. Amazing. Sinister. Allegorical. They are not all good unfortunately. The Missionaries was awful.